Christopher Logue Leads Final 29 of the $1,500 Omaha Hi-Lo After Day 2! With a late surge on Day 2, Christopher Logue pulled ahead of the competition in Event #4: $1,500 Omaha Hi-Lo 8 or Better, ending the day with a stack of 498,000 in his quest for his first WSOP gold bracelet. Of the 254 players who started the day, only 29 move on to Day 3. Nipping at Logue's heels are James Chen, Jared Hemingway, Jon Seaman, Kevin Gerhart and Kate Hoang who all have over 300,000 in chips. Still in the hunt for an additional bracelet to add to their collections are Marco Johnson (224,000), Jim Collopy (433,000) and Benjamin Zamini (340,000). There were 136 players who made it to the money today. The bubble broke just before the second break of the day with the unexpected elimination of Abdel Hamid which led to the remainder of the field (and some nursing half a big blind) to collect $2,253 for their efforts. Players who didn't make it that far included John Monnette, David Bach, Victor Ramdin, Jeff Lisandro, Men Nguyen, Mike Wattel and Jon Turner. Among those who did cash without moving on to Day 3 was last year's winner Benny Glaser (120th - $2,315), Brandon Shack-Harris (92nd - $2,425), James Woods (71st - $3,116), Bruno Fitoussi (47th - $4,027) and Tuan Le (42nd - $4,027). Players will return and need to eliminate two more before the final 27 get redrawn to the final three tables where they will play out the duration of the event. Play resumes Saturday at 2 p.m., with the final four tables of players competing to determine the winner of the WSOP gold bracelet and first-place money of $238,620. Players will play six more hands to finish out the night. James Chen opened the pot and found two callers. On the flop, both players checked to Chen who bet. Only Scott Buller called. The turn was the and Buller checked to Chen. Chen bet. Buller put in a check raise and Chen called. "I have two pair," Buller said. Buller turned up for two pair and Chen mucked. Todd Ickow raised from middle position before Gary Vick bumped it up from the button. James Chen called from the small blind before the decision fell back on Ickow. He called for 26,000 and was all in for less then the raise. The flop came and Chen check-called a bet from Vick. The turn brought the and again Vick fired out a bet after Chen checked. Chen was intrigued and stuck around. The completed the board and one last time Chen checked. Vick pushed forward another bet and was called by Chen who just needed to see what he was up against. Vick then rolled over his qd] for trip queens and scooped the pot after Chen tabled and Ickow flipped over . 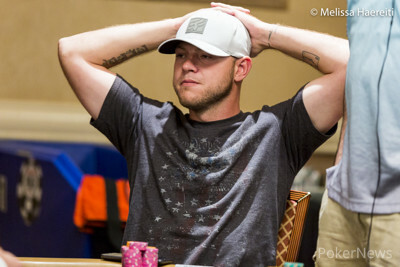 Paul Tedeschi's tournament run has just come to an end at the hands of Jared Hemingway. With a board reading Tedeschi was all in holding . On the other end, Hemingway held for a straight, and that was enough to eliminate Tedeschi. "Man, that guy had nine lives," Aron Dermer said, who was also sitting at the table. Despite those nine live, Tedeschi was sent to the payout desk to collect for his 35th place finish. James Chen opened. Chris Carey raised. Chen raised one more and Carey called all in for his tournament life. "I'm sorry," Chen said. "I have a very good hand." The board ran out giving Carey a straight and the scoop. On the very next hand. Christopher Logue opened. Carey raised. Logue made it three bets, Carey capped the pot and Logue called. The flop came and Logue bet. Carey moved all in for 14,000 more and Logue called. The board completed with the and the and that gave Logue the nut straight for the win. "Did he just say nice hand?" Carey asked. Logue, on the other hand has vaulted up the leader board and nears the top of the counts. On a flop of Aron Bermer checked from the big blind. Paul Tedeschi bet from the hijack and Jim Collopy called from the button. Bermer then reraised which prompted Tedeschi to move all in for 26,000. Collopy contemplated for a moment but decided to fold. Bermer committed the additional 6,000 and the cards were shown. Bermer had Tedeschi dominated until the board ran out running and to give Tedeschi the whole pot with a full house. "Impossible," said Bermer following the hand. 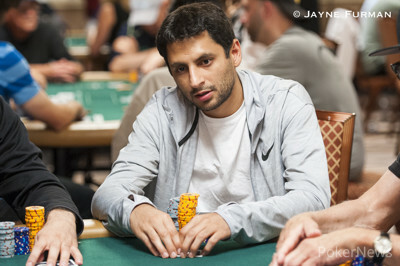 "Nice run out," he added, before slumping in his chair still taken back after losing the hand. 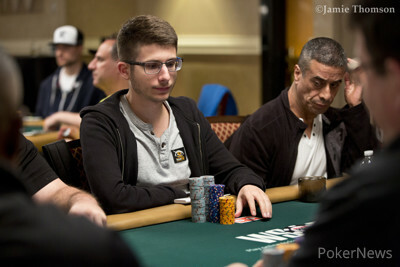 On a flop of Paul Tedeschi moved all in against Humberto Brenes and Jon Seaman. Both called and the three headed to a turn. On the turn, Seaman bet and Brenes called. The river was the and Seaman checked to Brenes who moved all in. Seaman called. The river gave Tedeschi the winning high hand with trip sixes. While Brenes quartered Seaman in the side pot, the two chopped up the low half in the main pot. James Chen raised from middle position before Christopher Logue bumped it up from the next seat over. Both Christopher Carey and Scott Fitzhugh called from the blinds followed by Chen who called. The flop fell and the action checked around to Logue who bet. Carey then raised and Fitzhugh called. Chen folded. Logue called. The turn brought the and Carey led out with a bet which both his opponents called. The completed the board and Logue fired one last time and was check-called by both players in the blinds. Logue then splashed his across the table and would be deemed to take half the pot with his two pair. Fitzhugh's would chop the low against Carey's with both holding an ace duece. On a flop of Humberto Brenes led out. Paul Tedeschi called, as did Aron Dermer. Ben Zamani let his hand go and the three headed to the turn which was the . On the Turn, Brenes checked. Tedeschi bet. Dermer folded, while Brenes called. The river was the . Brenes checked to Tedeschi who bet, then Brenes called. Tedeschi showed for a set and a low, while Brenes showed for a flush for the high, and the two chopped the pot. "If you called, I raise," Brenes told Dermer. "I know," Dermer said. "That's why I folded, I didn't want to get trapped." 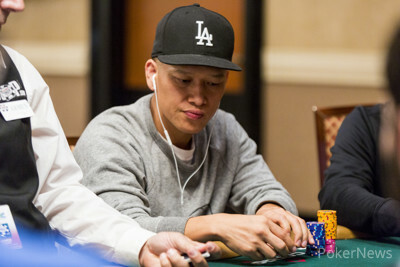 Tuan Le raised from the hijack and was called by Carol Fuchs and Jonah Seewald in the blinds. The flop came and Fuchs bet. 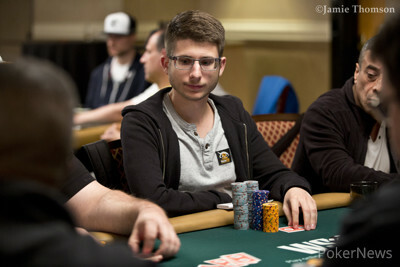 Seewald called before Le moved all in for his remaining 14,000. Both his opponents called for the extra 2,000. Both Fuchs and Seewald then checked down the on the turn and on the river. Le's would not improve as Fuchs took down the low holding and Seewald the high with rivering a pair. Denny Axel limped. One seat over James Chen raised. Next to act, Christopher Logue raised again. Axel moved all in and both players called. The flop came and Logue bet. Chen called. The turn was the and both players checked. On the river, Logue bet and Chen called. Logue showed and that was good for the main pot with a flush as Chen mucked. Axel showed , but that was no good. 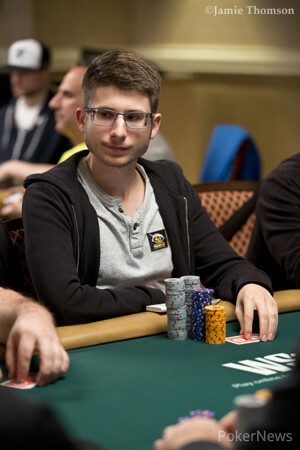 "We both flopped a flush draw," Axel said jokingly as he headed to the payout desk. Bryce Fox raised from the hijack and was called by Gary Vick in the big blind. The flop came down and Vick tossed in 4,000 in chips which is all Fox had left. "Not the flop I wanted to see," said Fox, before revealing his . Vick then turned his and had taken the lead with a pair of kings. The board ran out the and to see Fox unable to improve as he was sent to the rail. Players are now on a 15-minute break and will return soon. A preflop war left Andreas Klatt all in and at risk while Benjamin Zamani and Geroge Dicambio were left heads up going to a flop. The flop came and Zamani bet. Dicambio called. The turn was the and Dicambio led at the pot. Zamani called. The river was the and Dicambio checked. Zamani bet and Dicambio called. Zamani turned up for a straight and a low. Dicambio showed and thinking he had made a better hand, started taking back half the pot. But he was incorrect, Zamani's hand was good enough to scoop their side of the pot. Dicambio was forced to count out the difference and hand it over to Zamani. "Holy s***," Dicambio said, realizing his mistake. Meanwhile, Klatt turned up and it was not good for any side of the pot and he was eliminated from the tournament.